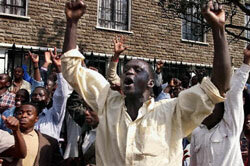 Kenyan opposition supporters protest corruption in Nairobi, Aug. 14, 2001 (Photo: AFP). In August 2001, 27-year-old musician Kenyan musician Eric Wainaina sang his popular Swahili hit, "Nchi ya Kitu Kidogo" (A Country of Bribes), to an audience including Vice President George Saitoti and a host of other government officials. As he began singing the second stanza of the song, the microphone went dead. Wainaina, whose acid lyrics decrying corruption in the Kenyan government had propelled him to stardom, left the stage humiliated, but not quite as humiliated as the politicians listening in the audience. Months later, Wainaina seems to have been vindicated. On Jan. 18, Berlin-based watchdog Transparency International released a survey ranking three government departments the most corrupt institutions in Kenya. David Ndii, who authored the study, found that Kenya's police topped the bribery league, followed by the Ministry of Public Works and the Immigration Department. Moreover, the study concluded, if leaks in Kenya's economy caused by corruption could be plugged, Kenyans' salaries would increase by 30 percent. Among other worrisome facts, the report revealed that adults Kenyan cities pay an average of 2,670 Kenyan shillings (US$35) monthly as a "bribery tax" to the police. Any Kenyan could rattle off a list of corrupt dealings in government offices daily. The complaints, as continually reported in the Kenyan press, are manifold: Precious few parents can have their children admitted to public schools without greasing palms, freedom is on sale in the courts, people have died in hospitals because they didn't know the right people, for a few hundred Kenyan shillings, drivers go scot-free after committing the worst traffic offences, underpaid civil servants remain aloof until they hear the crinkling of a 1,000 Kenyan shilling (US$12) note, elected officials skim from the treasury, tons of food imported from relief organizations disappear from government offices without any explanation. Here you can get documents to prove that your father died 10 years ago, wake up the following day, and get your father a passport. Sound Shocking? That's just the beginning: Forged university degrees from the country's most prestigious university are openly sold on the floor below that of the offices of the permanent secretary at the Ministry of Education, foreigners buy Kenyan passports over-the-counter at the Immigration Ministry, business licenses are sold to the highest bidders, CEOs of public corporations employ all the able-bodied men from their rural villages regardless of their qualifications, forests are destroyed to clear land dubiously grabbed by highly-placed government officials…. The list goes on. A task force from the Kenyan treasury looking into the 1997 general elections found that district commissioners diverted more than 1 billion Kenyan shillings (US$12.8 million) meant for Kenya's second multiparty elections into their own pockets. A cross-section of observers concur that the latest report goes a long way toward corroborating the rumor, now bandied on many Kenyan streets, that the country is slowly replacing Nigeria as a metonym for corruption in Africa. "Here you can get documents to prove that your father died 10 years ago, wake up the following day, and get your father a passport," says Kevin Omindo, a 35-year-old Nairobi-resident who confesses to have bribed the police on several occasions to avoid harassment. He hasn't read the report, but he wouldn't be surprised if it understated the extent of corruption in Kenya. Police spokesman Peter Kimanthi admits the police force is corrupt, but says that it is no more so than any other Kenyan institution. On Jan. 21, Kimanthi told Nairobi's independent Daily Nation, "I do accept that corruption exists in the [police] force, just like in other sectors. But the few rotten apples engaged in the vice have been nabbed and charged." When asked about the Transparency International report, he told reporters from the Daily Nation, "The report should have indicted the bribe givers as well, who are equally guilty." According to the same Daily Nation report, even Joe Aketch, deputy mayor of Nairobi, concedes that the Nairobi City Council is "one of the most corrupt" institutions in the country. Others tarred by Transparency International's report dispute its claims. "As damning as it is, the report does not present the true picture. There are many false charges leveled against us," avers Patrick Birgen, the public relations officer at the Teachers Service Commission (TSC), which Transparency International faulted for high-profile cases of corruption in the hiring and promotion of civil servants. Other agencies singled out by the report have been quick to issue statements in their defense. But many Kenyans, including the clergy, shrug off such denials as pro-forma. "Kenya is undoubtedly a den of large-scale corruption and the present government has to take flak for presiding over a debauched system," says Catholic Archbishop Ndingi Mwana A' Nzeki, who has long been a thorn in the side of the Kenyan government. While A' Nzeki approves of the Kenyan government's promises to fight graft, he says that the broad promises must be followed by specific strategies: "The government has said many a time that it is fighting corruption," he says, "but the fruits are yet to be seen by the Kenyan public." Solomon Owoche, a lecturer of political science at Nairobi's Catholic University of Eastern Africa, blames Kenyans' political apathy for allowing graft to flourish: "We are a populace that can easily be taken for a ride and be conned by politicians because many of us are busy looking into bread-and-butter issues," he posits. "While we are preoccupied with the struggle to put food on our tables, civil servants who are… supposed to serve us are busying themselves with looting the coffers to the bone." Owoche says the problem extends beyond the ruling Kanu party: "Even opposition political parties, always first to cast the moral stone whenever the KANU [the ruling Kenya African National Union] government's shady deals are exposed, cannot be exonerated. Most of [the opposition's] deals are also enshrouded in corruption." On Jan. 13, a team of British experts from the London firm Risk Advisor Group and Corporate Risk Services hired by President Daniel Arap Moi to advise his government on fighting corruption landed in Nairobi. The team—led by Graham Stockwell, a former commander of the London Metropolitan Police and Criminal Investigation Department, Stephen Kramer, an experienced British lawyer, and Sir Humphrey Maud, a former Commonwealth deputy secretary general in charge of economic and social affairs—has previously helped set up anti-corruption authorities in Hong Kong and Botswana. Their mandate is to confer with party leaders, members of Parliament, prominent businessmen, judges, and civil society groups to record their views on current measures to fight corruption and to make suggestions based on what they learn. While we are preoccupied with the struggle to put food on our tables, civil servants... are busying themselves looting the coffers to the bone. "This being an election year, the president will not mind the additional funds [in aid money] for the purposes of the electioneering process," Musikari Kombo, an opposition MP and Chairman of the Parliamentary Anti-Corruption Committee, told Nairobi's independent Daily Nation. It is not advice that Kenya lacks, but the political commitment to fight corruption, Kombo said. Last year, Kombo ruffled feathers when his committee released the names of prominent figures in the government accused of corruption. But after a Jan. 24 meeting with the British consultants, opposition leader Mwai Kibaki seemed to have had a change of heart. "Let us give them time," he told reporters, "What they need is a good political environment to carry out their work." Perhaps the cynicism with which the British experts were received is justified considering the fact that previous attempts to combat corruption in Kenya have ended in ignominy. In 1997, Kenya launched its first formal attempt to eradicate corruption from the government. Harun Mwau became the head of the Kenya Anti-Corruption Authority (KACA), with a mandate to identify corrupt practices and recommend prosecution. After barely a year in office, a tribunal declared Mwau "incompetent" after he implicated senior treasury officials in corruption cases, and replaced him with senior Justice Aaron Ringera. Soon after, in January 1999, KACA itself was dissolved after a constitutional court declared it illegal. Subsequent efforts to create another authority to replace it have floundered in Parliament. In the meantime, a police anti-graft unit has picked up where KACA left off. In the year since its creation, the unit only brought charges against two low-profile officials. But on Jan. 24, the unit called Mohamed Isahakia, a former permanent secretary in the Ministry of Environment and Natural Resources to court for allegedly stealing 11.4 million Kenyan shillings (US$146,153). On Jan. 24, Chief Justice Bernard Chunga announced the government would soon establish a court to hear corruption cases. He urged the anti-corruption police unit to finalize its investigation of corruption cases so that they could be prosecuted in the new court. Kenyans are still waiting. But many here still have deep misgivings about whether the police—which ranked as the most corrupt Kenyan institution in Transparency International's study—and the judiciary—which ranked sixth—can be trusted to handle corruption cases. Musikari Kombo, chairman of the Parliamentary Anti-Corruption Committee thinks he has a better solution: "Let the president set the tempo by sacking all senior government officials who have been implicated in shady deals."